Bb. 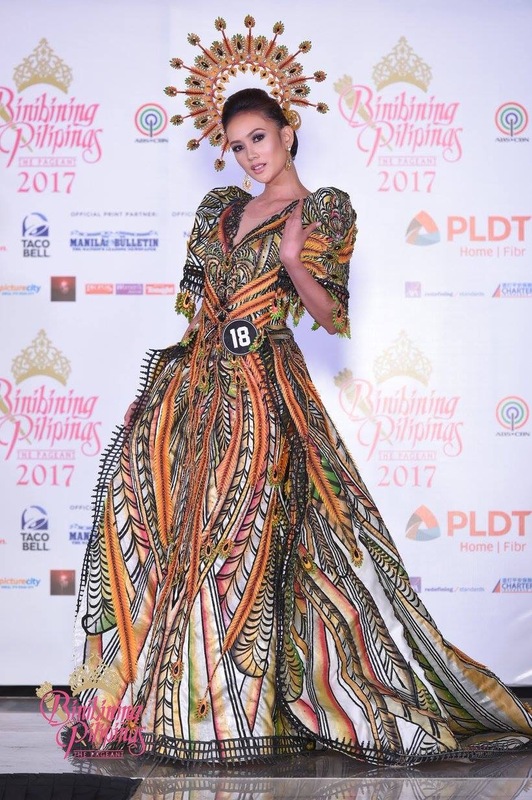 Pilipinas 2017: Who will wear this National Costume among the Binibinis? Posted in: 1 Pageant Pages, 2 Shout-out-Looks. Tagged: Adriano Samar, Bb. 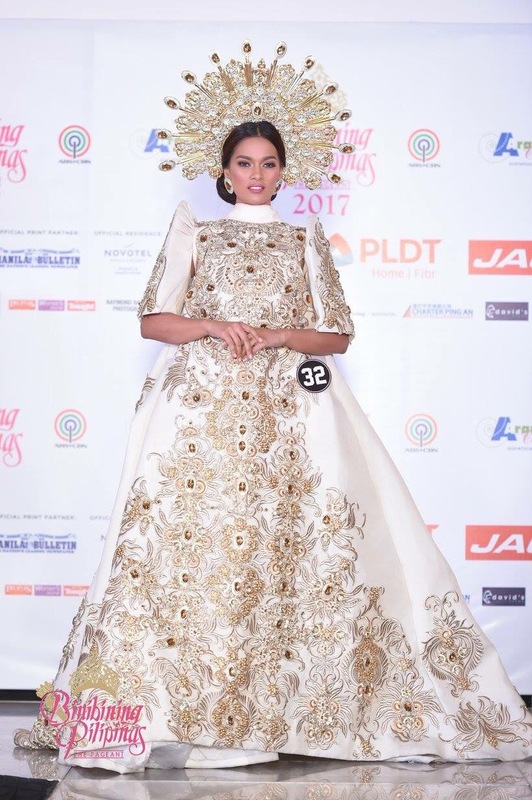 Pilipinas 2017, filipiniana. 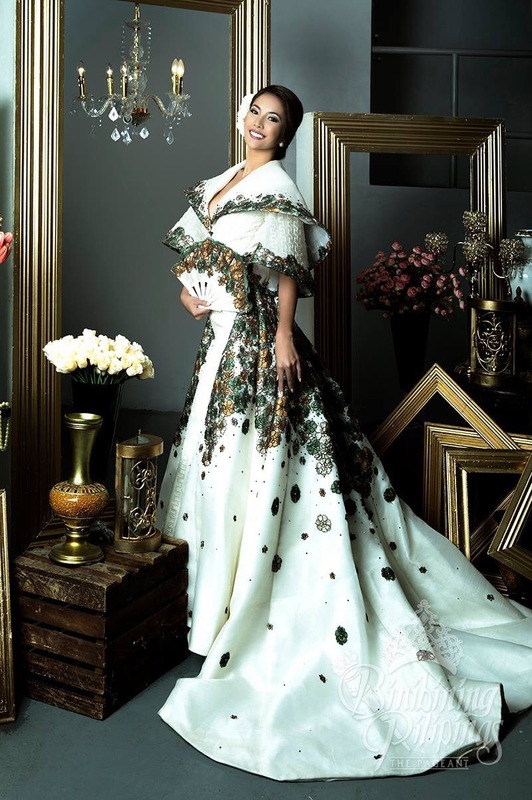 “This is a mermaid-cut Filipiniana gown accentuated with bouffant trail and exaggerated sleeves to add drama and highlight the figure of the wearer. 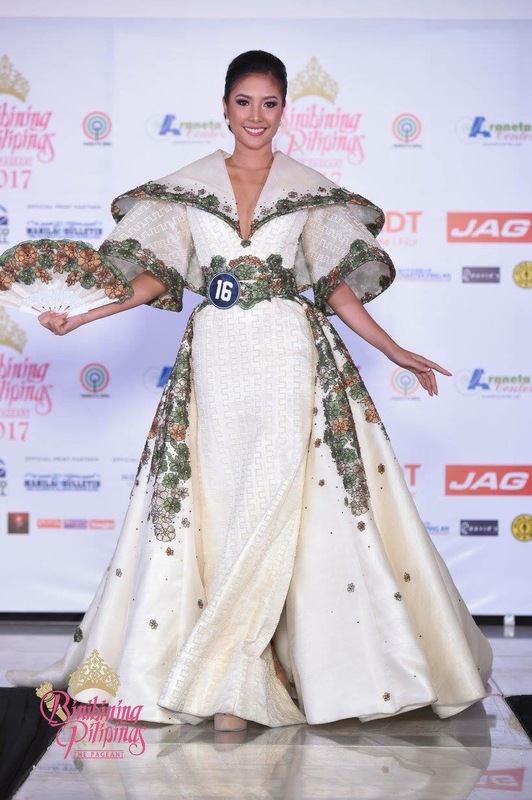 Its’ pañuelo is highlighted with floral embellishments down to its trail to dramatize the mystique and enchanting character of a Filipina. 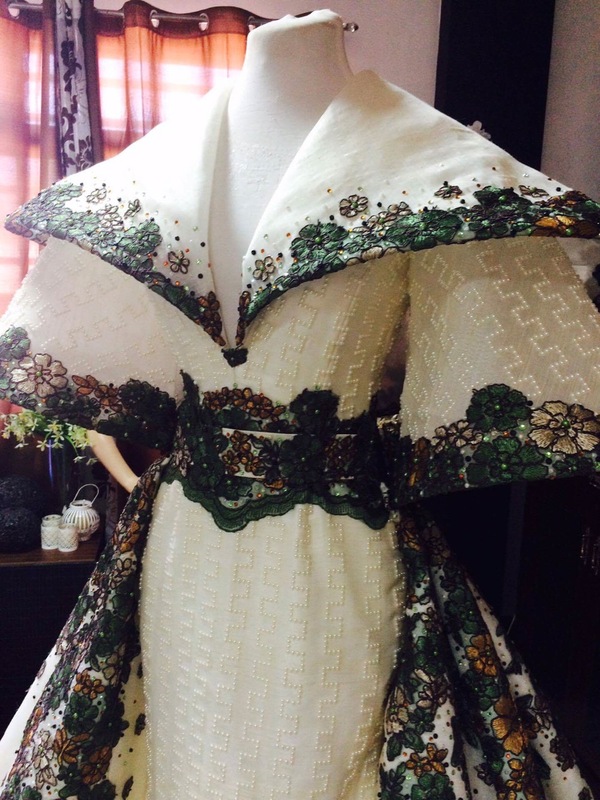 As for the question, who will wear this Adriano Samar masterpiece for the National Costume Competition of Bb. Pilipinas 2017? Posted in: 1 Pageant Pages, 2 Shout-out-Looks. 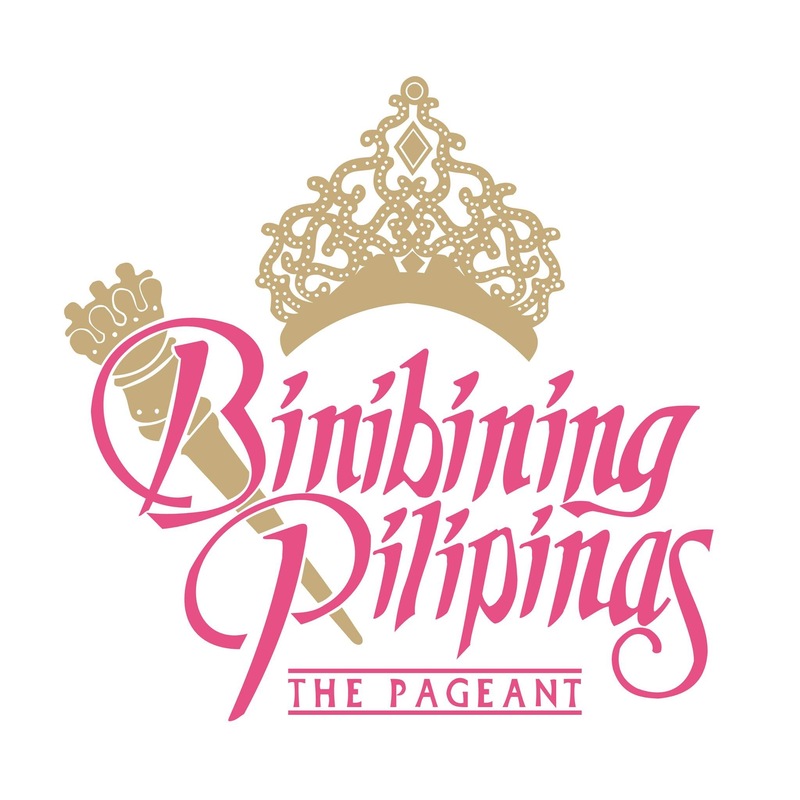 Tagged: Adriano Samar, Angelee delos Reyes, Carla Valderrama, Honey Christy Bandiola, Jona Sweett, Miss Philippines Earth Malay 2015, Mylene Misolas, Ryan Paul Artienda, Yussef Esteves. Over the weekend, I was pleased to have been invited to judge the finals of Miss Philippines Earth Malay 2015 at the Activity Center in Malay, Aklan. It was such an efficiently-organized beauty pageant that clocked in under three hours – a record of sorts in provincial competitions where the winners usually get to be announced at around 2-3am or worse, 4am. And I must admit how happy I was to be in the company of wonderful individuals who made the whole exercise more fun and exciting. 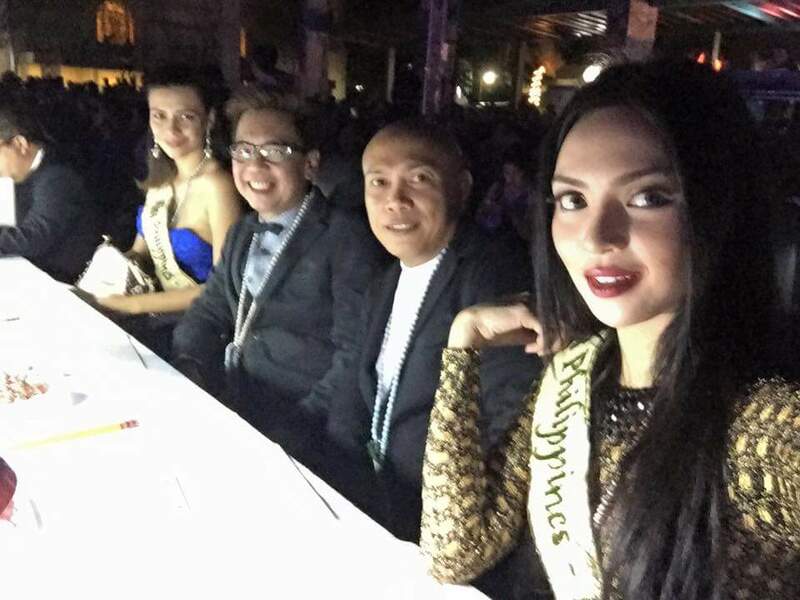 There’s host Miss Philippines Earth 2013 Angelee Delos Reyes and fellow judges Miss Philippines Earth Fire 2015 Carla Valderrama, Miss Philippines Earth Eco-Tourism 2015 Jona Sweett and TV character actor Yussef Esteves. 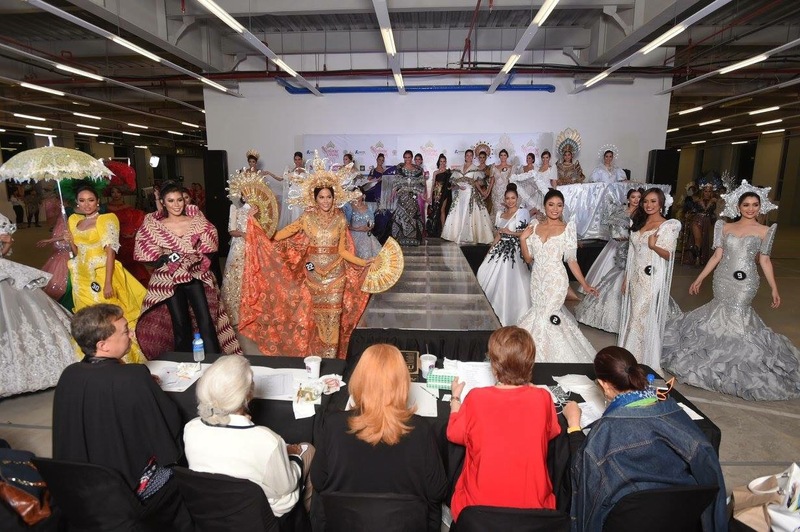 We all had a grand time, in addition to the continuous hospitality of Designer Adriano Samar and the Production Team with Tresha Lozañes and Raffy Cooper. Mylene Misolas of Carousel Productions was there to crown the winner, while upcoming showbiz talent Ryan Paul Artienda (who was Mr. Olive-C 2014) serenaded the candidates. 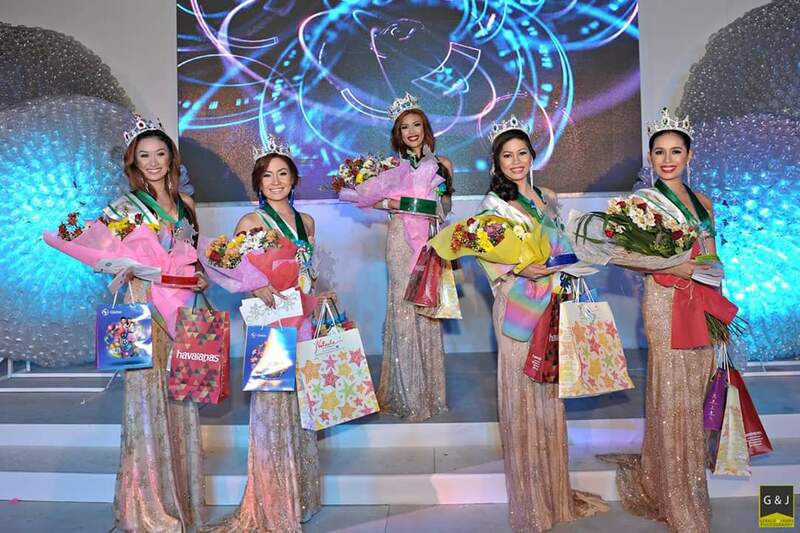 Eventually, the big winner – Honey Christy Bandiola of Manoc Manoc – was crowned after a close fight with Miss Air Fleur Talamisan and will now represent Malay, Aklan in Miss Philippines Earth 2016 scheduled earlier for April instead of the usual May finals. Other winners were Buena Pelayo (Water), Kate Montojo (Fire) and Crescielle Aron (Eco-Tourism). Posted in: 1 Pageant Pages, 2 Shout-out-Looks. 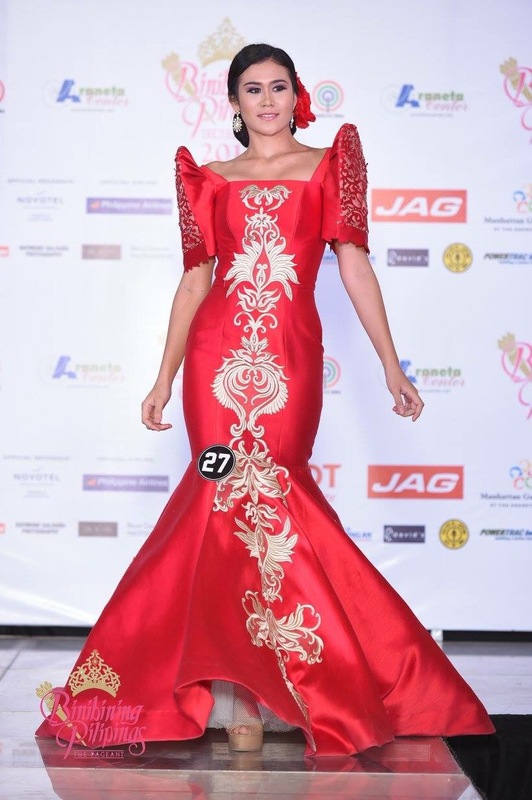 Tagged: Adriano Samar, Gerald Inocencio, Jona Sweett, Miss Philippines Eco-Tourism 2015. 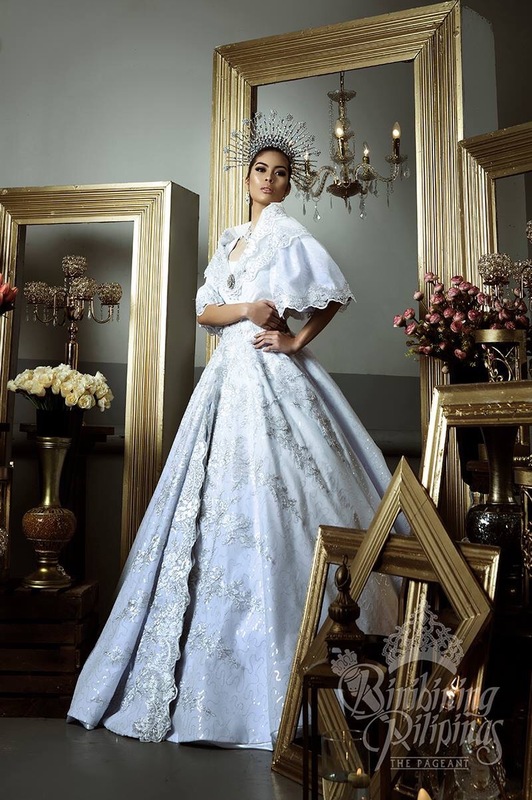 Just recently, Miss Philippines Eco-Tourism 2015 Jona Sweett had a pictorial for photographer Gerald Inocencio while wearing some of the latest works of Aklan-based designer Adriano Samar whom I featured here weeks back. Against the breathtaking backdrop of some of the still-unspoilt and unexplored areas of Boracay Island, Jona was at her most beautiful as she posed and projected with such ease. 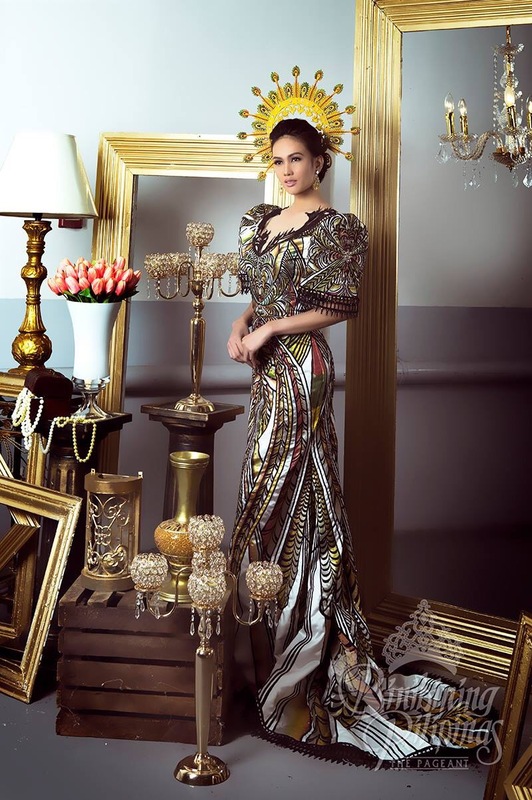 But then again, you look at the gowns she is garbed with and the effect is just as sparkling. If you want to see more of this photoshoot, just click HERE. Posted in: 1 Pageant Pages. 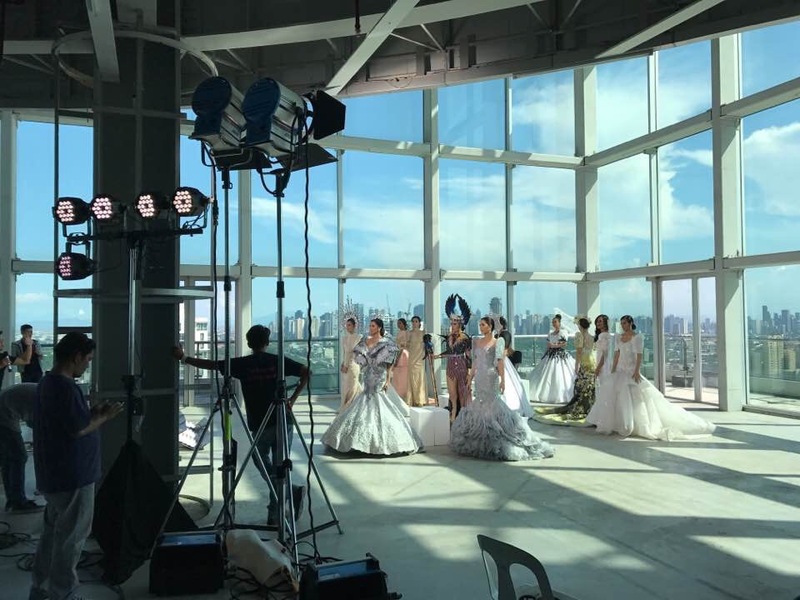 Tagged: Adriano Samar, Angelee delos Reyes, John Yap, Jona Sweett, Miss Philippines Bahrain, Miss Philippines Earth 2015, Rachel Lobangco, Zara Aldana. 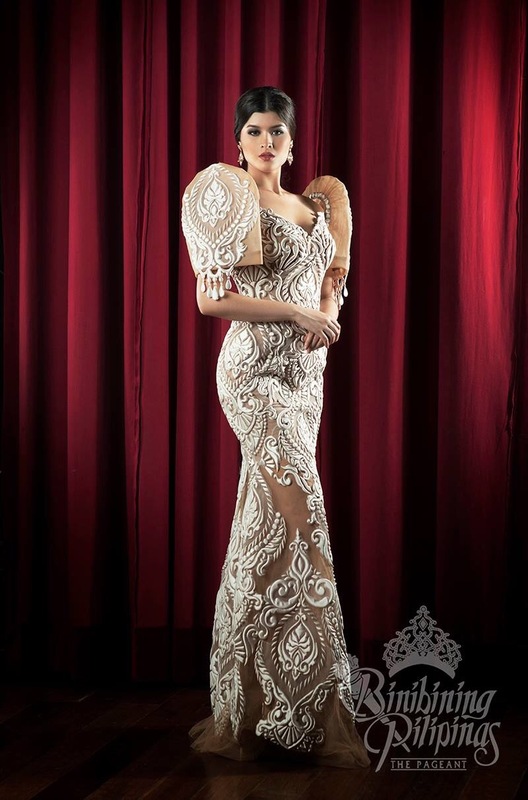 Prior to the Long Gown Competition of Miss Philippines Earth 2015, the name of Adriano Samar did not ring much of a bell in pageant circles. 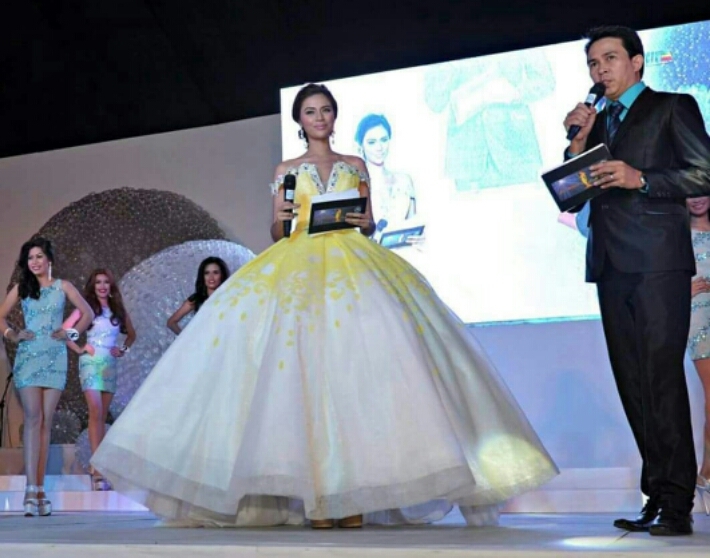 But after one of his creations was worn by Miss Iloilo City Jona Sweett (right photo) who was eventually declared winner of the Gold Medal as best in the event, there was sudden interest in the Boracay-based fashion designer. Not that his stock soared overnight, but seeing the well-executed white gown prompted some people to ask about him and his works. 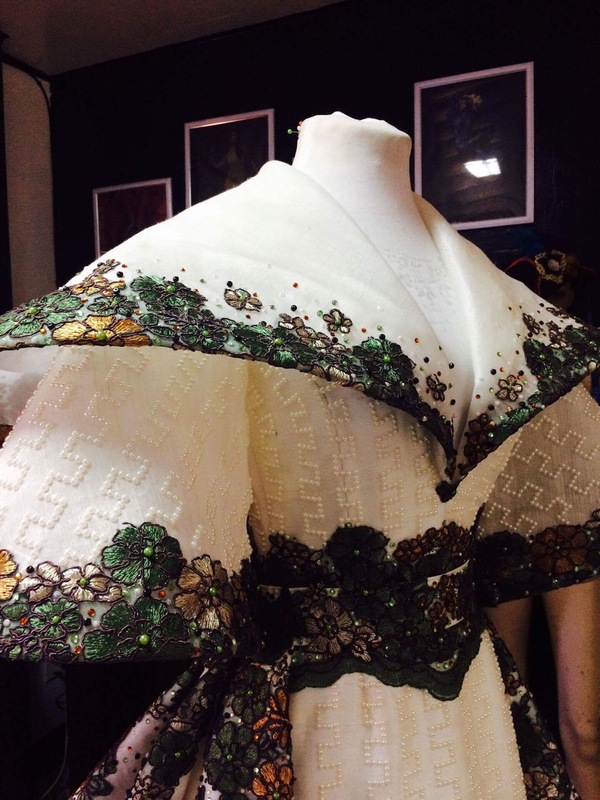 I am Adriano Sualog Samar, a budding fashion designer from Caticlan, Malay, Aklan…my high school dream was to be a famous fashion designer, and indeed became my passion! My Tita, Nelia Sancho (Miss Asia Pacific, 1972), who was the first person who believed in my talent, sent me to Ricky Reyes Learning Institute to be formally trained as a designer although it was just a short-term training. I also accomplished my college diploma in HRM in Aklan State University. After that, i went to Bahrain to work as a designer. In two years time working overseas, I was given a chance to explore the fashion industry and discover technical skills in fashion design. 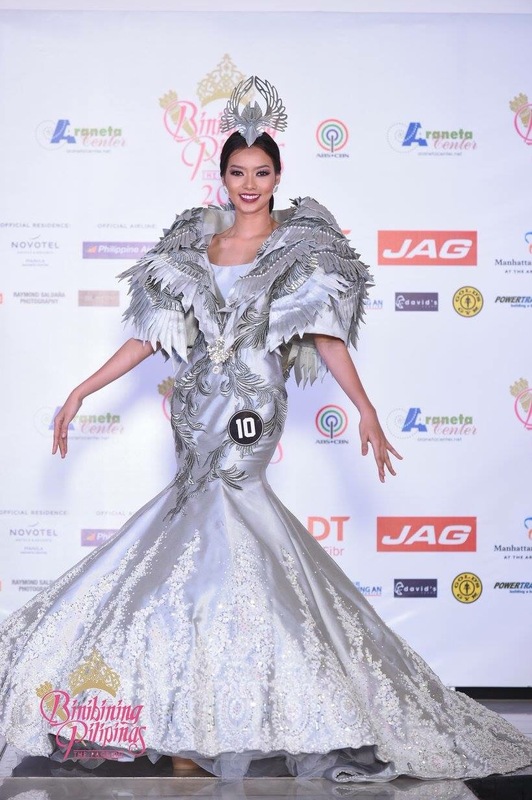 I also had the chance to dress up a contestant of Miss Philippines – Bahrain and garnered several awards in the competition including Best in Gown and the title itself. 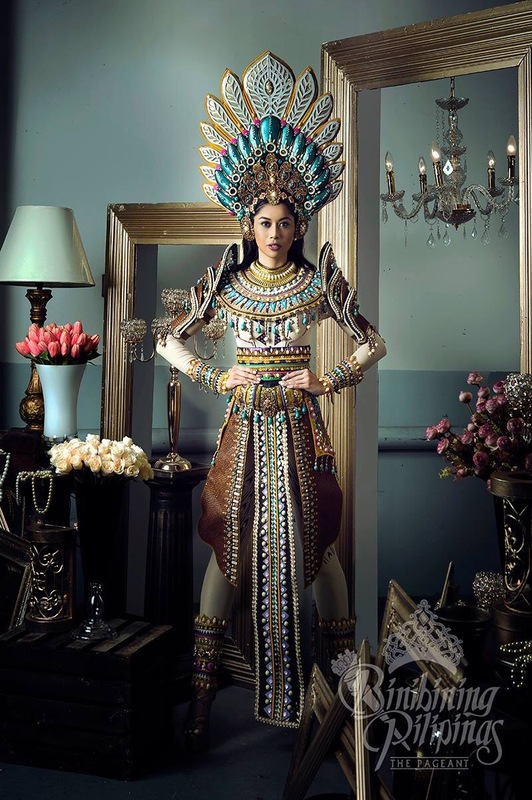 Because of that, I was invited to style various photoshoots for Filipino fashion magazines such as Bahrain Confidential. At a young age, I reckoned that was my major accomplishment. The knowledge that I was able to get working in Middle East polished my innate potential and that became a passport to compete in various local competitions when I decided to come back to my homeland. I was young and hungry for success so I went overseas to gain global experience. When I thought I was ready, I came back home to launch my own fashion design, catering a clientele not just in Aklan but also to the entire region. In 2012, due to the fame I brought to my town after my brand creates waves in the local scene, our Mayor of Malay, Hon. John Yap awarded me as one of Outstanding Young Malaynon, a prestigious award by the LGU to succesful young professionals in our municipality. 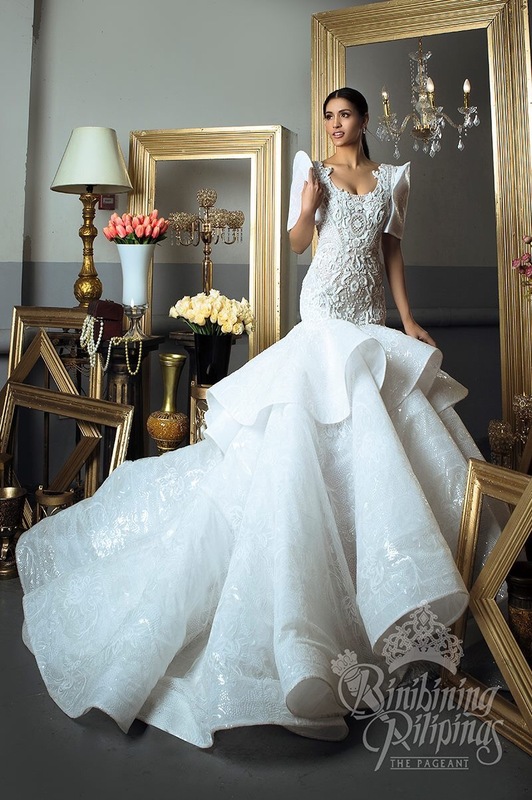 My business also operates and is one of the well-recognized in Boracay Island which has a high demand for ready-to-wear bridal gowns since the beachfront is one of the best places to wed in the world. I also make tailored bridal gowns for several clients. 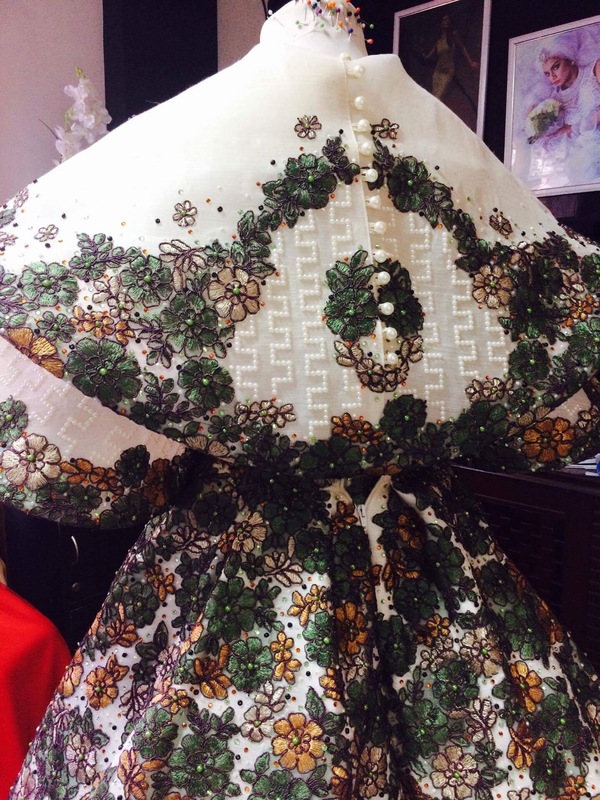 I define my designs as innovative and the intricacy of its details without sacrificing the comfort. I have several celebrity clients such as Claudette Delos Reyes ( Miss Earth 2013, Miss Rachel Lobangco and Zara Aldana Mutya ng Pilipinas 2007. This feature may not guarantee an immediate recall or popularity on the part of Adriano. But it will start the ball rolling, so to speak. And if he rises up to the occasion even more, then there’s really no other way to look but up.